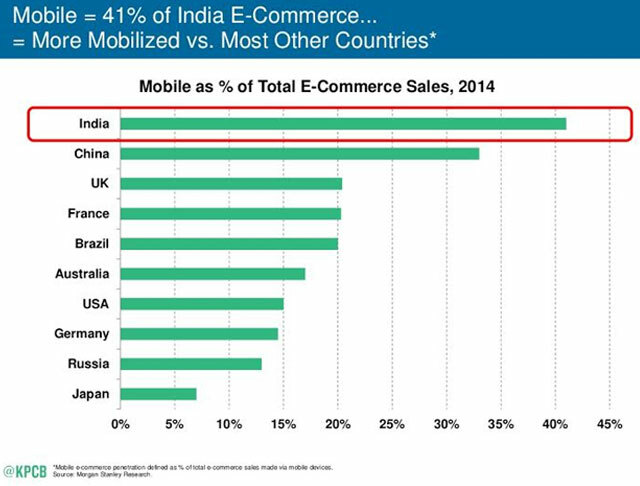 India leads the world when it comes to adoption of e-commerce using mobile devices, as per Mary Meeker's 2015 Internet Trends Report. The mobile platform constituted about 41 per cent of India's total e-commerce sales in 2014. On the other hand, mobiles accounted for 33 per cent e-commerce sales in China, 20 per cent in the UK, France and Brazil, 17 per cent in Australia and 15 per cent in the US, the report said. Meeker is a partner with US-based Kleiner Perkins Caufield Byers, a venture capital firm. 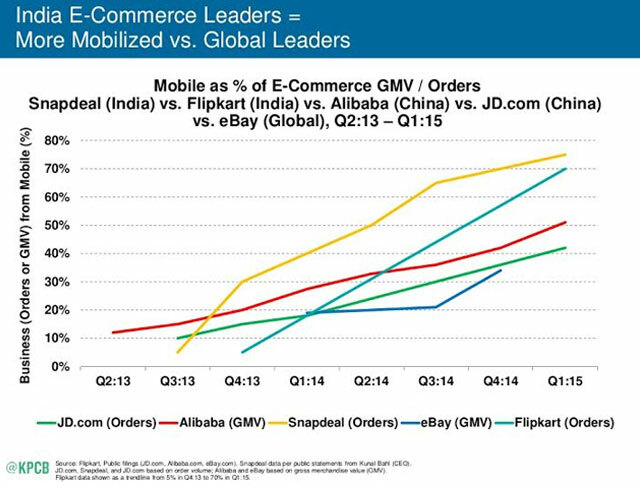 With 75 per cent of its orders coming from mobile devices, Snapdeal led the chart globally. Its competitor Flikpart saw 70 per cent of its orders (gross merchandise value) come from mobile, followed by Alibaba, JD.com and eBay with 50 per cent, 41 per cent and 35 per cent, respectively. The findings could be seen as validating online apparels provider Myntra's recent move to dump its PC website in favour of app-only usage. Most of Myntra's competitors, including big players like Snapdeal and Amazon, believe the app-only model to be slightly ahead of time. India also accounted for maximum broadband usage as a percentage of all internet traffic. 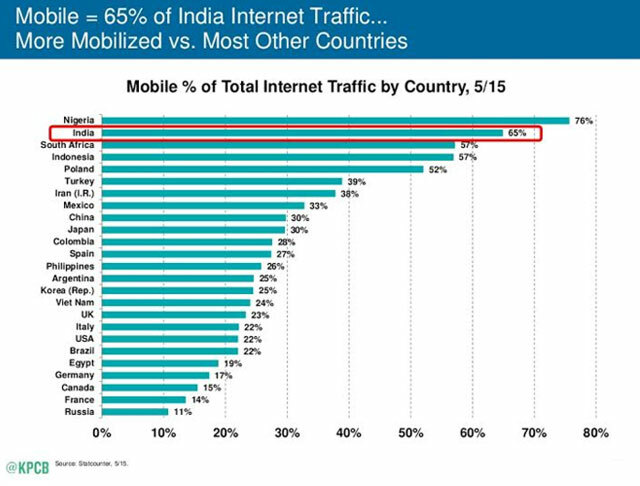 As of May 2015, mobile accounted for 65 per cent of India's internet traffic, second only to Nigeria where mobile traffic contributes 76 per cent. As of 2014-end, India had 140 million smartphone users, a 55 per cent growth from the previous year. India is the third-largest internet user market with 232 million internet users, growing at (37 per cent year-on-year) and is the top country in terms of new internet users. The country added 63 million new users in 2014. The report also says 3 of top-10 Android Apps in India are messaging apps. WhatsApp leads the chart while Facebook's Messenger is ranked fourth and Hike Messenger comes at the eighth spot.